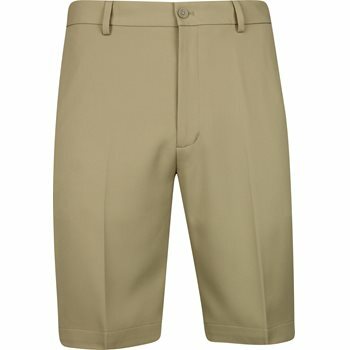 The Greg Norman Classic Pro-Fit shorts are constructed of 100% microfiber polyester and feature UPF 50+ and moisture wicking to ensure comfort and coolness on the hottest of days. In addition, the shorts are easy to care for and also feature comfort stretch for mobility and a shark tab on the back right. As answered on the listing, the inseam is listed as 11 inches.